I hail from New York. Not from British Columbia. Know what that means? It means I can mess with Nanaimo Bars. Go ahead. Ask me if I’m sorry. ‘Cause I’m not. I’d totally do it again. You should it! I promise I’ll tell you all about it. Nanaimo bars. It is not pronounced na-na-ee-mo bars, not that I ever walked around my house muttering that, something you absolutely cannot prove it would not hold up in court trust me I know things like this on account of how I am a lawyer and that’s why. And I may or may not have been just the teeniest bit depressed when I found out how it is really pronounced. I’ll never tell. Know how Ina Garten can’t stand cilantro, so she keeps that stuff out of everything that comes out of her kitchen, no exceptions made? I think that’s kind of annoying. But (although I’m no Ina, don’t roll your eyes ’cause I’m under no illusions), I kind of do it, too, but with nuts in dessert bars and such around here. And it’s not because of me & my personal tastes and preferences. It’s on account of my very wrong children. The poor little dears don’t care for nuts in their dessert bars. One difference here straight away is that I feel bad about legislating against nuts in dessert bars. But I know you, and I know you’re pretty swift. Let’s say – for argument’s sake – that I put nuts in the ingredients to these here Na•nai•mo Bars. Boom! You’d know right away that, like, something wasn’t quite right. In a hot second, you’d be sayin’ – hey, blog lady, there’s no nuts in the picture but there’s nuts in the ingreds. What up? You’ll just have to wait until the printy recipe to see how I solved this here problem-o. Suspenseful! Anyway, these are (mostly) no bake. It’s all, make a layer, chill. Make the next layer, chill. That sort of thing. I’m usually pretty suspicious of no-bake. It tends toward the grody. But it’s okay. I’ve totally got this. Not grody at all. And one of the ingredients is Bird’s Custard Powder. It’s a British thing. But I find it easily in my regular garden-variety supermarket. And I checked. Totally gluten-free. A teeny bit on the expensive side, but not too bad at all for an import. Don’t feel like an ingredient scavenger hunt? No biggie. Just replace with an equal amount instant vanilla pudding powder. Don’t let it break your stride. The bottom layer is traditionally graham cracker crumbs, mixed up with cocoa powder, butter, an egg, shredded coconut, and nuts. I have a really nice recipe for GF graham crackers in my cookbook p. 214, but maybe you don’t have the cookbook. I’m not a high pressure cookbook salesperson. 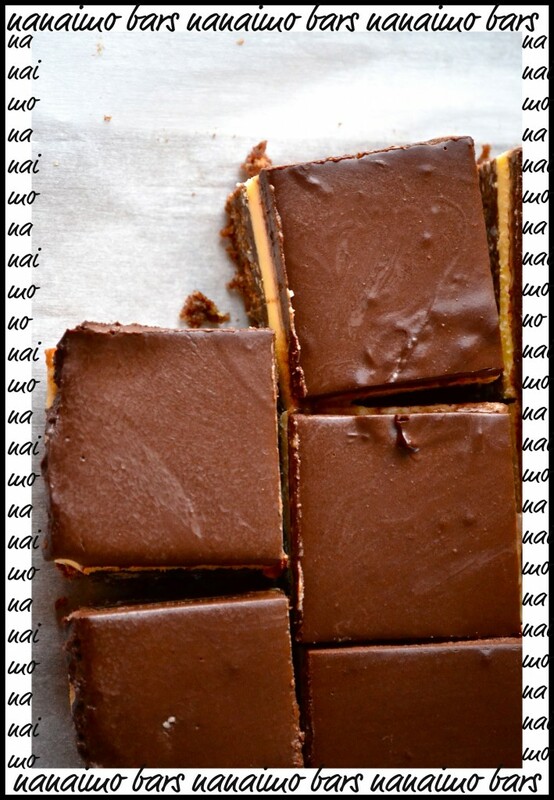 You should be able to make nanaimo bars without having to buy my cookbook. So I used ‘Nilla Wafers. You can use either. Free country. Oh, and I messed around with the top layer. It’s meant to be a chocolate-butter combo. I changed it to more of a ganache. A chocolate-cream combo. Silky smooth. And I used unsweetened chocolate, which I sweetened just a bit, ’cause the middle layer is basically a custard buttercream, and it’s super sweet. I’m all about the yin & the yang. And it’s seriously grown up, too. Not cloyingly sweet. You could defo just use regular semi-sweet chocolate & be done with it. So, you know. Not that I don’t love our talks. I do. But it’s time to get down to bid’ness. Grease the bottom of an 8 inch x 8 inch square pan, then line it with two crisscrossed strips of parchment paper, overhanging the edges of the pan and greasing in between the layers and on the top layer. Set the pan aside. First, make the bottom layer. In a medium saucepan, combine 1/2 cup (8 tablespoons) unsalted butter, 1/4 cup granulated sugar and the cocoa powder. Over medium heat, stir until the butter is melted and the mixture is smooth. Remove the pan from the heat. Beat the egg very slowly into the chocolate butter mixture, whisking or stirring constantly (to temper the egg so it doesn’t scramble). Place the saucepan back on the stove, and cook, stirring constantly, over very low heat for about 1 minute (so the egg is no longer raw). Remove the pan from the heat, mix in the cookie crumbs and the coconut (and optional nuts), and stir until well-combined. The mixture will be crumbly, but should still be moist. With wet hands, press the mixture firmly into the bottom of the prepared baking dish in an even layer. Chill for 30 minutes in the refrigerator. To make the middle layer, cream the remaining 1/2 cup butter, 1/4 cup cream, and the custard powder until well-combined. Mix in the confectioner’s sugar until smooth and shiny (see the picture). Once the bottom layer has chilled, spread the buttercream mixture on top in an even layer. Chill another 30 minutes or until firm. For the top layer, place the unsweetened chocolate and remaining 1/4 cup granulated sugar in a medium sized heat safe bowl and set it aside. Heat the remaining 1/2 cup cream in a small saucepan until it simmers. Pour the cream over the chocolate and sugar mixture, stirring constantly until smooth and pourable (see the picture). 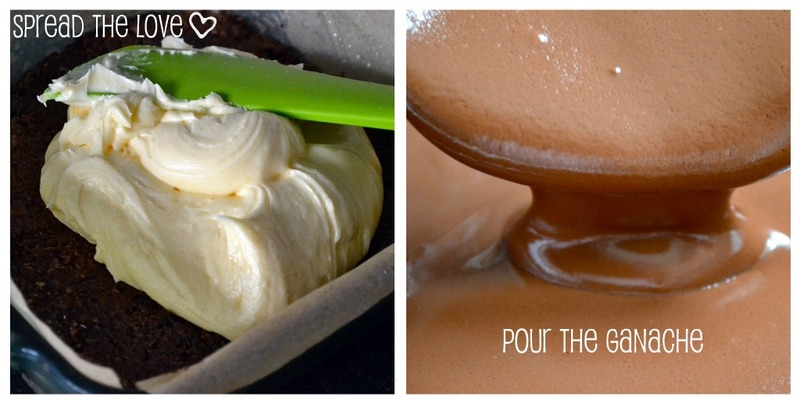 Pour the chocolate mixture over the chilled buttercream layer in an even layer. Tap the dish flat on the counter to break any air bubbles. Chill one final time until the chocolate is solid and shiny. It will also be darker in color (see pictures). Remove from the pan with the overhung pieces of parchment paper. Peel back the parchment paper, and slice with a cold, wet serrated knife into 16 squares. Serve chilled. I live in British Columbia next the Nanaimo BC….We grew up with these bars everywhere as a very common treat…Now I can have them back into my life again Thanks to you…Yippie! But I must add that the Pronounciation is actually: Nan-niy-moe bars. Cant wait to make this recipe and finally use up my Birds Custard Pwdr. Man do these sound good! I’ve never heard of them before here in Indiana. I just think I might try these. They look yummy!!! You read my mind! I was thinking today how I will make these for Christmas Eve! So when you find this Bird’s stuff in the store, in what isle is it lurking? Baking? I’m not much for scavenger hunting in my local Whole Foods. Too many locals grazing. It gets dangerous. Thanks! OMG! When I opened this email a few days ago I gasped. My husband’s head turned around very quickly to see what was the matter. 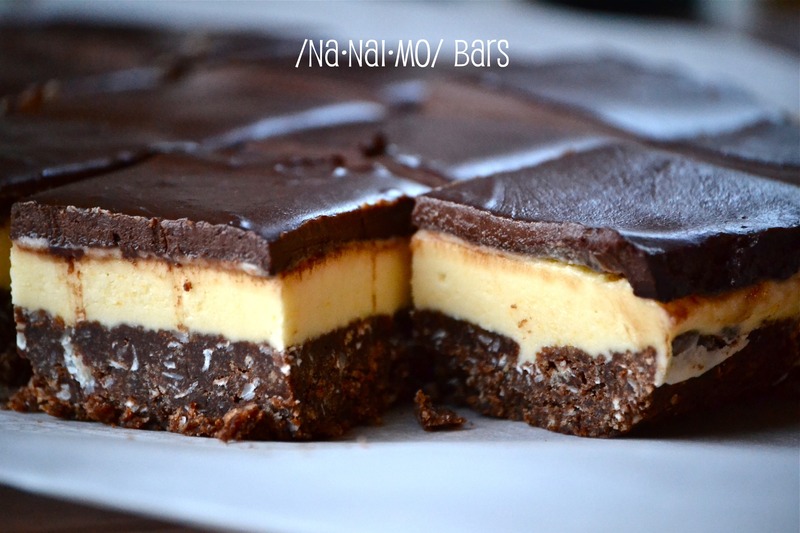 I showed him the picture on my screen, of these beautiful bars and said, “Gluten free Nanaimo bars! !” He laughed. And of course I got up immediately to go to the store to buy the ingredients. No problem finding the Bird’s Custard stuff. Never noticed it before but never needed to. There it was, dusty and waiting for me. And this recipe. In my house we have a rule that dessert night is only on Friday and Saturday nights. It’s to keep us all from eating too much dessert. And for my little ones to stop requiring one more thing for me to cook for them every single day. How I justified this one was, I needed to put some kind of deliciousness into their lunchboxes. :) Never mind that they will very likely only get one because these are my absolute favorite bars in the whole wide world! Nicole, they turned out beautifully! They were incredible. You nailed it! I love the dark chocolateyness of them, the perfect creaminess of them. My oldest son said the crust reminded him of the fabulous Samoas Girl Scout cookies. Yess! As much as I loved every part of it, I thought the crust was a bit too thick. I might try to make them in a 9×13 pan next time and double the top and middle layers recipes but keep the crust the same so it’s a bit thinner. That’s all. Love, love, love them. Thanks so much for your wonderful recipes and cute blogs. You know I did. Everything I make is for you (much less of an exaggeration than you might think). I think you should have Nanaimo Bars every 7 days! Every 7 minutes! 7 years is not an acceptable interval. Not acceptable! Wonderful! Everyone from my hometown (Bellingham, WA) knows of these bars and loves ’em. Thanks for the recipe, I am going to have to do an egg-free/dairy-free version which will be a challenge. Not sure where I can find this custard you speak of, but maybe I’ll try the local gluten-free store I have. If I remember the last one we had was made with peanut butter flavoring in the middle. Ok, so nevermind… I just found your post on how to make them!!!! Ahhh I feel the same about nilla wafers; I’ve missed them soooo much! I’m buying your cookbook now!!! Thanks! Angie, you won’t regret it! Thanks for supporting me by buying the cookbook! So, this might sound dumb and crazy, but are nilla wafers gluten free???? Am I thinking of the same thing? ‘Nilla wafers are most definitely not gluten-free. If you click on the hyperlink to ‘Nilla Wafers in the post, it will take you right to my recipe for ‘Nilla Wafers on this blog. They’re super easy, and they taste just like the real thing. Worth a try! I hope that helps. Thanks for jumping in, Anon. And thanks for the props! I need to make a trip to the store as well. These look so yummy!!! No-bake always a good thing for me, especially when I want something sweet but don’t want to turn on my oven! Call ahead to make sure they have Bird’s! Otherwise, just use instant vanilla pudding. No biggie at all. are gluten free vanilla wafers available on the market? Nope. There’s a recipe for them here on the blog. must try these but I am egg free, so would the flaxseed/water slurry be an acceptable sub for the eggs? Here are the Bird’s Custard ingredients: cornflour, salt, colour: annatto; flavouring. Instant custard sounds like it would be perfect for you – and even a good substitute for instant pudding for other purposes, maybe.